In late September, Apple announced that app slicing, an App Thinning feature of iOS 9, was unavailable to developers because of an iCloud backup issue. Apple today updated developers on the status of app slicing, noting that it's once again available for use following the iOS 9.0.2 update and the recent Xcode 7.0.1 update. App slicing is one facet of App Thinning, an iOS 9 feature designed to decrease the size of iOS apps to save valuable space on devices without a lot of storage space. With app slicing, users only download the app assets created for their particular device rather than a full set of assets for multiple devices. For example, on an iPhone 6s, a user will only need to download iPhone 6s specific files, ignoring both larger iPad artwork and lower quality resources for earlier iOS devices. To take advantage of the space saving features in app slicing, all iOS 9 users should upgrade to iOS 9.0.2. App slicing is not available in earlier versions of iOS 9 or in iOS 8.
is there an easy way to update already downloaded apps? without deleting and reinstalling? Developers have to add support for it to their apps, and their ability to add that support was just re-added. They'll support it in their upcoming updates. So deleting/re-installing the app today would simply overwrite today's app with another of the same. Once they release an update to support App Slicing, you'll be able to download it. In the App Store, there is a section called Updates. Apps that have available updates will show there. I'm assuming that iTunes still downloads the full app bundle as it doesn't know which devices you may then sync it to, so does adding an app via an iTunes sync also filter out the bits you don't need or do you get the full App bundle and thus use up more space on the device than if you downloaded the app straight from the App Store on the device? You get the full app. App slicing just means that Apple’s servers host multiple variants of the same app version for different devices instead of just one app like before. Your device isn’t going to ‘slice’ the apps itself, so when you transfer them from iTunes then you won’t get the smaller version. Apple retracted the feature because it interfered with iCloud backups. No word on iTunes backups though, sadly. 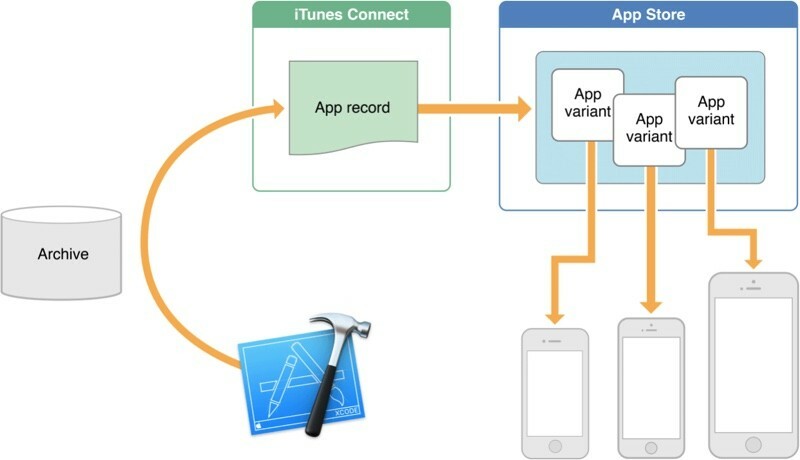 Note: For iOS apps, sliced apps are supported on the latest iTunes and on devices running iOS 9.0 and later; otherwise, the App Store delivers universal apps to customers. There should be a way to update parts of an app. Redownloading a complete +1GB app just for a couple simple bugfix in the program file is ridiculous. On top of that many developers don't seem to care to clean up their distribution packages, leaving an awful lot of unused clutter and rubbish for us to fill our devices. Once the 100Mb over-air limit cannot be reached anymore, many developers seem to get lazy. It should. But personally, unless I got a new iPhone each and every year, even with App-thinning I wouldn't consider a 16GB iPhone a prudent choice. Perhaps not future-proofed enough. My beloved 16Gb iPad Air 2 would be so glad to hear this news!! These days, 16 Gb iPads make a lot of sense too. So realistically.... what I'm most interested in --- how long do you think it will take for apps to implement this? Is this something that will happen next year? In the next few months? Weeks? Possibly days? I may be getting old but I remember the days when apps used to be in the lower MBs - now most apps I use see it as an achievement if they are able to keep it around 100MB. Those of us who pay for Google Drive and (yes) Apple iCloud storage - would love to be able to utilize some of that storage for app data, apps, and other "storage" items that don't need to be on demand. Thought it was pretty sweet back in the old days of Android when I could install apps (when I was rooted) to the 32GB SD card. That didn't last too long.